Wireless emergency safety equipment could save livesif signals are transmitted reliably. But few performance standards exist. Now, tests at the National Institute of Standards and Technology (NIST) are helping to ensure that alarm beacons for firefighters and other emergency responders will operate reliably in the presence of other wireless devices. NIST is providing technical support for industry consensus standards by developing test methods to evaluate how well these devices work under realistic conditions. The latest NIST study focused on interference between Personal Alert Safety Systems (PASS) with wireless alarm capability, and radio-frequency identification (RFID) systems. 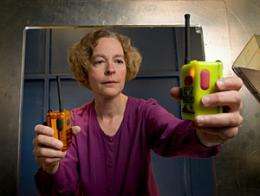 The methods developed in the study can test interference in other wireless devices such as radios, hands-free cell phone headsets, local area networks, and urban search and rescue robots. PASS devices sense movement and activate an alarm if a firefighter remains motionless for too long. Newer PASS systems also have a wireless link connecting incident command base stations and portable units, allowing emergency recall signals to be sent to firefighters or firefighter down alarms to be sent to the base. Because firefighters also may carry RFID tags for location tracking, or may be in warehouses or other buildings using RFID inventory systems, there is potential for significant interference. The NIST research, to be presented at a conference this week, measured interference between frequency hopping PASS and RFID systems operating in similar frequency bands. Results show that, when signals are weak due to environmental or other conditions, a portable PASS units receipt of an alarm from its base station can be delayed or fail even without interference, and becomes more likely to fail in the presence of only moderate RFID interference. Strong interference caused longer and variable delays that sometimes exceeded a minute, defined by the researchers as signal failure. NIST researchers also found that an RFID system can be less reliable when the PASS unit is nearby. The NIST tests involved measuring the total output power of each system in a test chamber and then isolating the systems in different labs for the interference tests. The portable PASS device and RFID tag and reader were placed in a test chamber, while the PASS base station was in a separate room. Researchers evaluated performance at various levels of signal strength and interference. NIST is working with the National Fire Protection Association, which will consider adopting the NIST tests as part of revised PASS performance standards. An NFPA technical committee on electronic safety equipment will soon consider the wording of a draft standard, and after a public comment period, the standards could be approved by 2013. At that point, manufacturers would need to show that their PASS devices pass the tests. More information: K. Remley, et al. Interference tests for 900 MHz frequency-hopping public-safety wireless devices. Presented at the 2011 IEEE Electromagnetic Compatibility Symposium, Long Beach, Calif., Aug. 17, 2011.